First, I used my electric sander to sand the top of my table to help remove the sheen in order to get the primer to stick well. You don't have to take off the finish - just rough it up a bit. Then give it a coat of primer using your extra roller (you could also use the roller that comes in the chalkboard paint kit and just rinse it when done). Set aside to dry completely. Once the primer was dry, I added a coat of the Saltire (white) paint sample over the top and set it aside to dry again. While I was waiting for it to dry, I cut out the stencils I wanted from the stencil sheet. I also followed the instructions on the stencil adhesive spray to spray the back of the stencil and set it aside to dry as instructed. 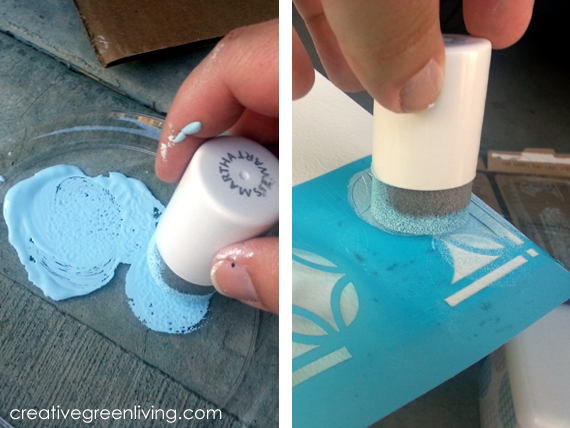 Once the white paint is dry, squeeze some Azure Sea paint onto a small plate. Dip your foam pouncer in the paint, pouncing on the plate to remove the excess. 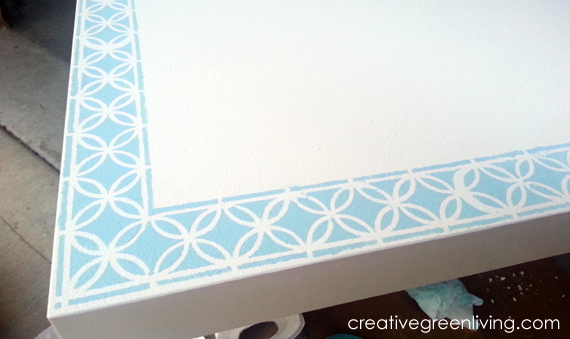 Start stenciling by adhering the corner stencil pattern to the corner of the table. 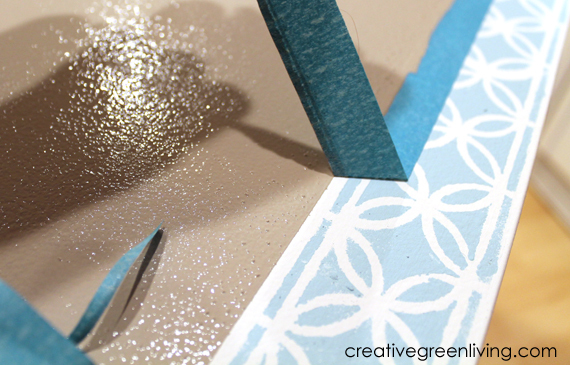 Apply paint using a light up-and-down bouncing motion. Do not stroke or smear paint as it may push the paint under the stencil. Lift the stencil up and move to a new area. 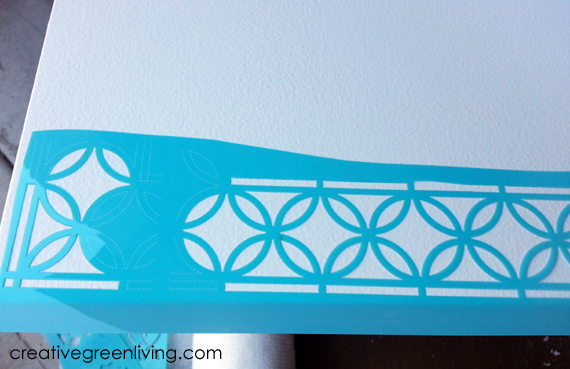 Once you are done, you'll have a pretty stenciled border. Set it aside to dry completely. I let it dry overnight. Once the table was dry, I used painters tape to tape off a large square in the middle of the table. I left a little bit of a white border between the edge of the blue stenciled area and the new chalkboard area to mimic the stenciled pattern. 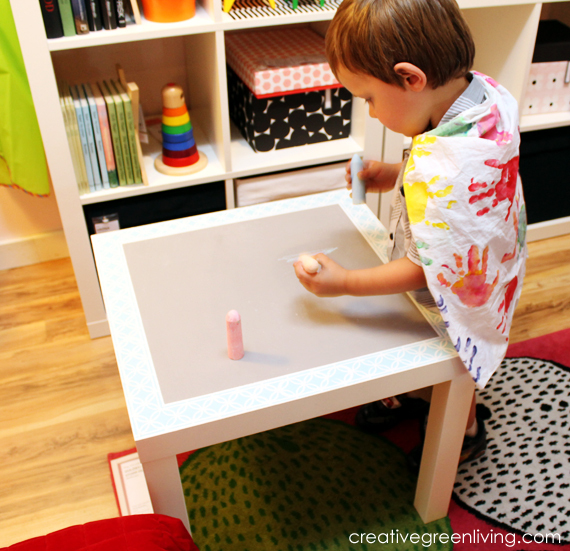 Shake the chalkboard paint in its pouch and then squeeze some into the tray that came in the chalkboard kit. Using the roller, paint one coat of chalkboard paint going in one direction. Paint the second coat going at a 90 degree angle to the first coat. Place the tray and roller in a plastic bag in the fridge between coats. 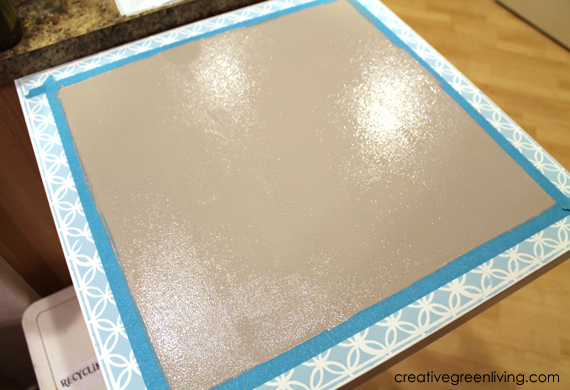 See this post where I painted my fridge for more detailed information on how to apply the chalkboard paint. Once the second coat of chalkboard paint has been applied, remove the painters tape while the paint is still wet. 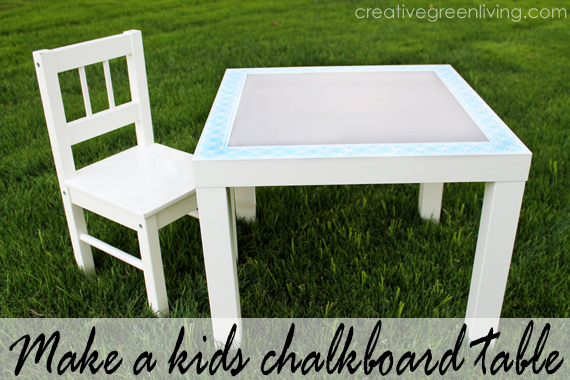 Allow the chalkboard to dry at least 6 hours or overnight in order to cure. 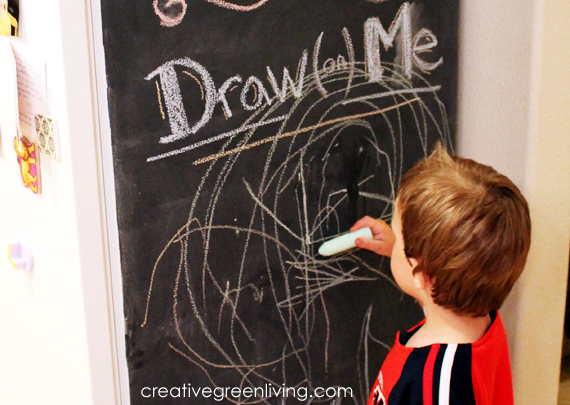 To prime the chalkboard surface, rub the side of a piece of chalk all over the surface and then wipe off with an eraser or old rag. 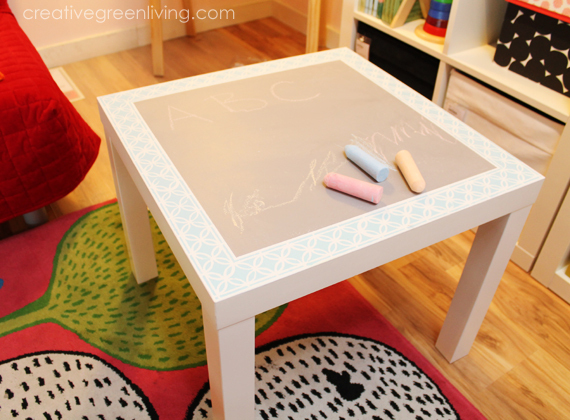 This chalkboard paint is so versatile! In addition to this table, I also painted the side of my fridge with chalkboard paint. Be sure to check it out! Disclosure: I was provided with free product and was compensated for my time creating a project for a different post. This project was created with leftover product on my own time. 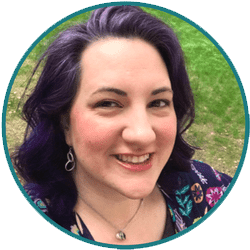 Project execution, thoughts, opinions, dislike of VOCs and love of Lullaby Paints are my own. This stuff is genuinely awesome - I wouldn't say it if it weren't true! 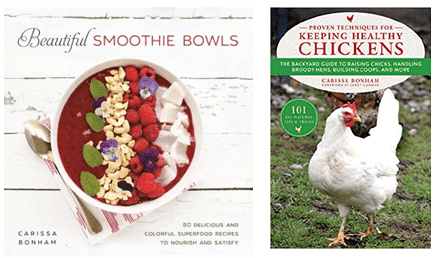 See my full product review policy here. So cute!!!!! Wish my kids were still at the chalkboard stage. This would have been great. But I love the way to dressed up that table. I have so many pieces around my house that COULD be really cute with a little love. But I'm not that crafty, with paint.